Trace the route of the Holy Family on their journey from Jerusalim to Egypt. Visit the Church of the Holy Virgin located on the banks of the Nile, the Hanging Church, the Monastery of the Holy Virgin at Al Qusiya, a popular site for pilgrims from ancient times, Wadi Natroun and many other Christian sites. Egypt Travel representative will meet & assist you at Cairo International Airport. After that you will be transferred to your hotel by a private air-conditioned vehicle. Upon arrival at the hotel he will check you in and give detailed information concerning your tomorrow’s trip. Overnight in Cairo. 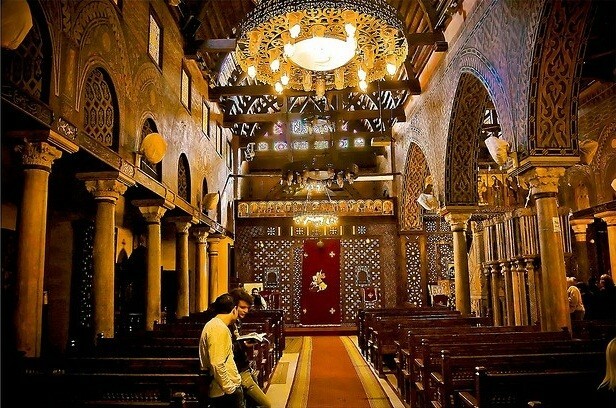 Enjoy a trip to Samanoud on the Damietta branch of the Nile, where a church commemorates the resting place of the Holy Family. Then proceed to Sakha, where the Holy Family is also believed to have visited, and a place renowned for its Christian community in the Middle Ages. Back to Cairo & overnight. After breakfast, enjoy a visit to Wadi Natroun, a desert area said to have been blessed by the Christ, with three monasteries still existing today. Begin your trip with Deir al-Baramus which is the oldest of the surviving 4 monasteries, and in many ways the most isolated, then proceeds to Deir Anba Bishoi whose body is still in the monastery. You will end your trip with Deir El-Suryani which is the smallest and most compact of the 4 monasteries. Overnight in Cairo. Visit the Holy well and sacred tree at Matariya on the outskirts of Cairo, a well-attested resting place of the Holy Family and a popular destination among medieval pilgrims. Also, see the Church of St. George, as well as the Fortress of Babylon in Old Cairo, which the Holy Family passed by, and visit the ancient churches, including the Hanging Church and St. Sergius, in the same area. Overnight in Cairo. After breakfast, transfer to see the Church of the Holy Virgin on the banks of the Nile at Maadi, to the south of Cairo, where Jesus and his Virgin Mother boarded a sailing boat to the village of Deir Al-Garnousin Upper Egypt. Transfer by an air-conditioned vehicle to this village near the town of Maghagha about 04 hours driving, where the Monastery of Arganos was later founded. Here, outside the Church of the Virgin, a well is believed to have provided Jesus and his Virgin Mother with the water they needed. Also, see the beautiful church hewn out of the cliff beside the river at Gabal Al-Teir in Minya. Overnight in Minya. Trip to the Monastery of the Holy Virgin at Al Qusiya, a popular site for pilgrims from ancient times. Jesus and his Virgin Mother are believed to have stayed at this site for over three years. Overnight in Minya. After breakfast, you will be driven back to Cairo to check in your hotel in Cairo about 04 hours and half driving from Minya. Overnight in Cairo. Breakfast, and transfer to Cairo International Airport for final departure. Accommodation for 2 nights in Minya including daily breakfast. All sightseeing tours in Cairo and Minya are private tours. A bottle of mineral water per trip per day. Meals as mentioned in the above itinerary. Free Mobile phone during your stay in Egypt (charged) about (30 min Local calls or 2 min. International Calls).